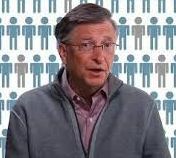 The following are excerpts from Bill Gates' 2013 annual letter that was published last week. His foundation focuses on improving education in the U.S and health, agriculture, and family planning in developing regions. As Gates applies his commercial sector approaches (admired by some and criticized by others) to the efforts on his foundation, he continues to learn from his experiences. Regarding project success: Anyone that has managed a successful project or participated in a good investment understands the need for establishing clear goals, persistently focusing on objectives, measuring milestones and adapting to change. Regarding the efforts of Jim Grant: He was a trailblazer in the use of data to pursue positive project outcomes. As Gates’ notes, continued success does not take place on its own, but requires continual support. Regarding the U.S. education: The system is broad and diverse with many strengths and weaknesses. Generally, a focus on improving student success will drive positive outcomes, while situations that contend with conflicting objectives remain significantly challenged.